Neuropathic, nonhealing ulcers and mutilating deformities are common complications of leprosy in developing countries. Of the estimated 12 million leprosy patients in the world today (4) as many as 15% may have such ulcers. Phenytoin, used for 50 years for the treatment of seizures and a variety of other conditions (2), has been reported to promote wound healing including leprosy ulcers (1,2,3), Thefavorable results of these studies prompted us to conduct a controlled inpatient trail to investigate further the efficacy of topical phenytoin compared to topical zinc therapy in the treatment of trophic ulcers. Fifty patients (41 males, 9 females) were treated with phenytoin and 22 (17 males, 5 females) were treated with zinc oxide cream (26% prepared by our hospital's pharmacy). In both groups 60% of the patients were in the age range of 30-50 years. Patients were admitted to the leprosy ward of New Teaching Hospital of Dr. S. N. Medical College, Jodhpur, India. In the phenytoin group, 34 patients had ulcers on the forefoot, 2 in the midfoot, 5 on the heel, 4 on the leg, and 5 in other locations. In the zinc group, 13 patients had ulcers on the forefoot, 3 on the heel, 2 on the leg, and 4 in other locations. Prior to phenytoin or zinc therapy, in cases where there was only a moderate exudate, a sodium fucidate ointment dressing was applied for 2 days. In patients with clear secondary infection, systemic antibiotics appropriate to the culture and sensitivity data were administered for up to 6 days. After removal of hyperkeratotic tissue, the wounds were cleansed with normal saline, and the ulcer diameter was determined by caliper measurements (The Table). After saline cleansing, the ulcers were covered with a thin layer of phenytoin powder or zinc cream and dressed with sterile gauze. In both of the groups, this treatment was repeated daily until the ulcer had healed completely. Wounds were assessed daily at the dressing change by the following clinical parameters: appearance of granulation tissue, exudation, change in ulcer size, and percentage of healing. Any adverse reaction to the topical agent applied was also recorded. Caliper measurements of maximum wound diameter were made weekly. 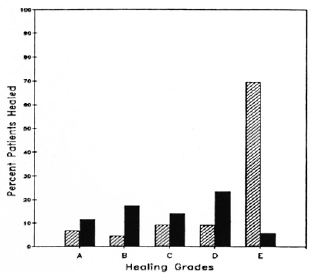 A formal overall clinical rating was also made weekly using the following scale: A) no healing; B) healing < 25%; C) healing > 25%, but < 50%; D) 50% or greater; E) complete healing (including epithelialization). Healthy new granulation tissue appeared in 31 of the 50 phenytoin-treated patients (62%) within the first 7 days. In the zinc-treated group, 5 of 22 patients (23%) showed a comparable response. 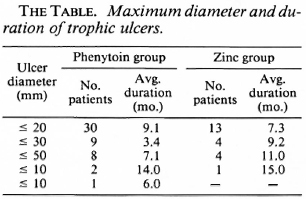 New granulation appeared in 10 of the phenytoin-treated ulcers by the third day, but with zinc there was no new granulation tissue until day 5 (two patients). While 62% of the phenyioin-treated ulcers had new granulation tissue by the end of 7 days, the peak observation of this effect was not seen in the zinc-treated ulcers until the end of the second week (13 of 22 patients, 59%). Consistent with the earlier appearance of healthy new granulation tissue, exudation was also eliminated much earlier in the phenytoin group. Ulcer exudate disappeared within the first 3-4 days in the 21 phenytoin-treated ulcers which had such exudate. With zinc, the exudate continued at least through the second and third weeks in 7 out of 22 patients with exudate at time 0. By the end of the second week, four of the phenytoin-treated ulcers had healed completely. Eighteen phenytoin-treated wounds achieved grade E by the end of 6 weeks. As shown in The Figure, by 12 weeks, 30 of the 43 (70%) remaining in the. study had complete healing. Healing in the zinc group was slower. None of the ulcers healed completely in the first 6 weeks and, at the completion of the trial at 12 weeks (The Fig. ), only six patients had complete healing. Overall, 34 of the 43 (79%) phenytoin-treated patients completing the study had ulcers that achieved grades D-E, compared to 5 of 17 (29%) of the zinc-treated patients (The Fig.). A x2 test showed the differences between the phenytoin and zinc groups to be significant at p < 0.001. There were no adverse effects in either group. The Figure. Results of 12-week treatment. = Phenytoin; = zinc. In our study, phenytoin was superior to zinc oxide cream in promoting healing of chronic, trophic leprosy ulcers. Our results confirm the findings of Barba-Rubio, who observed an accelerated granulation tissue response with topical phenytoin in seven patients with trophic ulcers (1). Phenytoin was effective without strict bed rest. Although the literature states that bed rest is often sufficient in healing trophic ulcers, we have not found it so. Of interest is the reduced incidence of secondary infection requiring antibiotics with phenytoin as compared to zinc treatment. Because phenytoin is easy to apply, requires no special training or monitoring, and is readily available, inexpensive and safe, its broader use and evaluation (including double-blind studies) in developing nations having a heavy load of leprosy patients seems indicated. - Yasawant K. Malhotra, M.D. - Syed S. Amin, M.D. Acknowledgment. This study was supported by The Health Foundation, New York, New York, U.S.A.
1. Barba-Rubio, J. El difenilhidantoinato en lepra: su aplicación tópica en ulceras y mal perforante planter. XII Congreso Mexicano de Dermatologia, Oaxaca, Mexico. 9-12 Octubre, 1985. 2. Smith, B. H., Bogoch, S. and Dreyfus, J. The Broad Range of Clinical Use of Phenytoin; Bio-electrical Modulator; Bibliography and Review. New York: Dreyfus Medical Foundation, 1988 (3100 ref.). 3. Smith, B. H., Moore, M. and Jain, K. Topical phenytoin and wound healing: report of the First International Conference on the Uses of Phenytoin in Dermatology, December 12, 15, 1987. Int. J. Dermatol. 27 (1988) 528-530. 4. WHO Study Group. Epidemiology of leprosy in relation to control. Geneva: World Health Organization, 1985, pp. 11, 21, 26, 29. Tech. Rep. Ser. 716.